In the interest of full disclosure, this blog post is going to be biased because Marcia Clark is one of my personal heroes. She has gone through so much in her life, and she is just a fascinating person. If I could meet one “celebrity” I would definitely choose Marcia Clark. 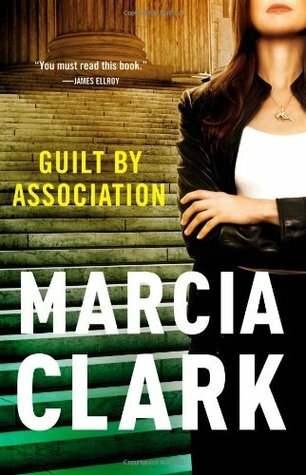 Guilt by Association is the first novel (but not the first book) by Marcia Clark. It was followed by three others in the series as well as a few short stories, all of which center around the main character LA Deputy District Attorney Rachel Knight. For those who don’t know, Marcia Clark was the lead prosecutor during the O.J. Simpson Trial. If you haven’t heard of that or don’t know all the details, PLEASE go watch American Crime Story: The People v. O.J. Simpson immediately! You may wonder why I think Marcia Clark is so awesome even though she lost the trial. Failure is a part of life. Marcia not only endured a massive disappointment when she lost the trial, but she had to deal with being completely maligned by the press and public. So much of the criticism was about her being a woman in a man’s world. She went through hell publicly , and she came out the other side. She chose to never prosecute another case, and who can blame her after all that she went through? But she didn’t give up on life. She used all of her legal expertise and her eye for detail and became a best-selling author. Now, back to the actual book I’m reviewing: Guilt by Association. In this first installment of the series, we get to know the character of Rachel Knight really well. She is smart and determined and has an eye for detail – just like Marcia Clark. She even has an eerily similar job to Marcia Clark and often has to deal with high-profile cases. Is Marcia Clark’s character perhaps overly autobiographical? Maybe for some, but I loved that she’s writing what she knows. To me, it really works because she clearly understands the legal system and Rachel Knight, as a character, is well-developed. She’s tough but not invincible. She’s feminine when she feels like it. She endures disappointment and fear. She’s Marcia Clark, and she’s all of us. In this novel, Rachel finds the dead body of a trusted colleague next to a prostitute. As she investigates, will she uncover her colleagues innocence or guilt or something even more sinister? I thought that the mystery was very engaging, and I enjoyed both the plot and the character development. However, something that might turn off other readers is that there is a lot of description that can, at times, be considered extraneous. I happen to like tiny details like this because I think that they still serve to set the scene and make everything feel real, but I do think it’s a valid criticism from others since the details often aren’t crucial to the story. I think this all boils down to preference. So, if you like a well-detailed legal thriller, give this one a try!